An oven is the cornerstone of any kitchen as it's where the vast majority of cooking will be done. There are a variety of different oven types, which are categorized by how they cook food and any extra features they might have. Choosing the right one is key to getting the best results from it. 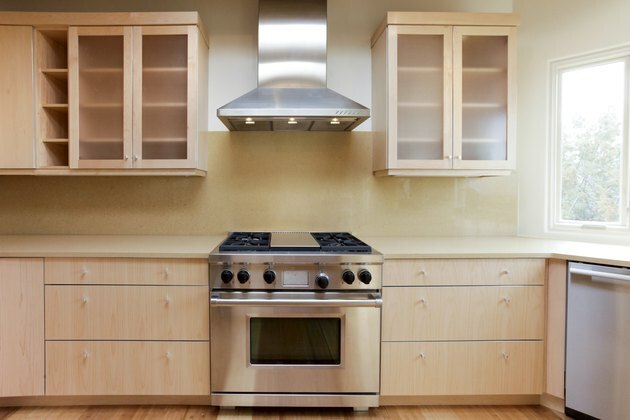 Each oven type has certain pros and cons that can affect whether it's right for you. Gas ovens, as you may guess, use gas as their power source. The burning gas is what creates the heat for the oven. They're often cheaper to run than their electric counterparts because they heat the oven to temperature more quickly. However, most newly built living spaces don't use gas for safety reasons – particularly blocks of apartments. Getting a gas line fitted can be extremely expensive, too. Gas ovens tend to be a little pricier up front but could result in greater savings down the line. Some also claim that gas ovens are better at retaining moisture, making them better for roasting meats. Electric ovens are the most popular option on the market. They're fairly cheap, easy to run, easy to clean and suitable for the vast majority of home cooking needs. Electric ovens tend to produce a more even heat, as there's no one heat source. This makes them great for baking. On the other hand, they can be a little more expensive to run. Electric ovens can be further separated into convection and conduction types. Convection versus conduction is all about how the oven heats up air. A conduction oven is the more common type and is sometimes called a "conventional" or "fan" oven. A conduction oven heats from the bottom up. They're generally without issue, though some users complain they leave some pockets of cooler air near the top of the oven. Convection ovens circulate heat with a fan in the back and are designed to make the temperature within the oven more even. The fan can make an electric oven more efficient so food can be cooked at a lower temperature, saving energy and money. If you're using a convection oven, it's worth being mindful of the height of the sides of your dish in case the circulating heat ends up skimming over your food. A popular extra feature is a self-cleaning oven mechanism. Everyone hates cleaning their oven, but these handy models help you get around this chore. There are two types of self-cleaning oven – pyrolytic and catalytic. Pyrolytic ovens heat up to extremely high temperatures to burn off food stains, so users simply have to sweep the ash out of the bottom. Catalytic ovens are lined with chemicals that absorb food spills before they can become burned on. While undeniably handy, these features are expensive, and some are concerned with their safety. Microwave ovens are a type of electric oven that heat food using electromagnetic waves. These vibrate food particles, and the friction causes the food to heat up. While microwaves are known mostly as tools for reheating food, nowadays they can do much more. Microwave ovens are very quick and energy efficient. However, for tasks such as roasting or browning, they may struggle. A roaster oven is designed to roast, steam or slow cook. They're particularly useful during the holidays when oven space is limited. Many designate a roaster oven for their meat, freeing up their main oven for all the side dishes. While not an alternative to an oven, a roaster can be a valuable addition. A toaster oven is almost like a portable grill. As the name suggests, they're ideal for making toast but can also be used for pizzas and other such items. Again, these aren't alternatives to a full oven, but having one can be very useful, particularly for large families.